After a long winter, the signs of spring are finally upon us, although a little delayed. Spring is a time for renewal, and as the ice leaves the lakes, water temperatures warm, frogs begin to sing, the walleye begin their annual spawn. It is a small one to two week window but if you are in the right place at the right time, it is an incredible sight. Walleye spawn in both river rapids and lake shoals, and their choice of spawning habitat may be genetically determined, as they return to the same sites year after year. I have had the pleasure of coordinating walleye spawning bed enhancement projects for the last few years, but I have not been able to personally observe it myself until this year! The members of the Malcolm & Ardoch Lakes Landowners’ Association (MALLA) extended me an invitation to join their crew, as they surveyed and conducted their walleye counts for 2018. MALLA has been extremely active in their walleye management practices, taking the time to conduct counts and restore several spawning beds on Malcolm & Ardoch Lakes. After partnering with MALLA to enhance two spawning beds on Ardoch Lake this past summer, I was so excited to see what all our efforts would reveal. Dusk Falls on Malcolm Lake, Ontario. My adventure began with a scenic drive in North Frontenac that evening arriving at 9 pm, right after dusk. 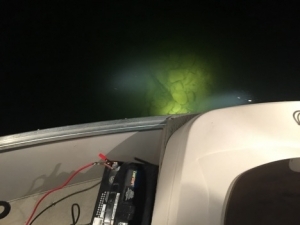 Walleye are nocturnal spawners, meaning they spawn at night, therefore to conduct counts, one must use high powered spotlights. What is extremely helpful to distinguish fish species in the dark, is that their eyes glow or reflect the light (just as a cat’s eyes do). Captained by Don Martin, our boat left the dock at 9:20 pm with Brenda and Gerry Martin operating the two spotlights. With excitement and anticipation, I had my camera ready as we started to search for the Malcolm Lake walleye. 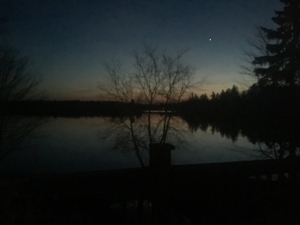 It was a picture perfect night, calm and mild, and as we headed to first spawning bed, the air was filled with the sounds of the spring peepers and the return of the haunting loon calls. This is why I love what I do. As we approached the first bed, my heart started to quicken in anticipation as I have only seen a handful of walleye before when out fishing with my family. As we scanned the bed, we noted a few small fish but no walleye. Our captain thought it might be still a little early in evening, so we moved onto the next bed slowly scanning the water as went. As time ticked by they started to appear, with glowing eyes they were hard to miss. What I learned very quickly though is that walleye are camera shy! As soon as light is reflected on them they swim away, so photographically capturing these beauties was going to be a challenge. Walleye on a spawning bed in Malcolm Lake! As we explored bed after bed, it was apparent that their numbers were less than the previous night. Conditions were changing, the water was warming up (ideal water temperatures are 7 degrees Celsius) so the walleye were around but not necessarily on their spawning beds. 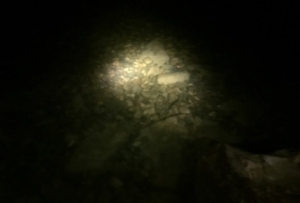 After an hour, we made our way through the culvert and up river to Ardoch Lake where the two spawning beds we enhanced were located. Scanning the river we found a few sucker fish patiently waiting for their dinner provided by the walleye. We approached Ardoch Lake slowly, as the previous day it was still covered with ice. We noticed several areas of slush but were able to access the spawning locations. With water temperatures reading 4.5 degrees Celsius, we were not expecting to see much activity. The two enhanced spawning beds looked fantastic, the rocks were clean (if the shoals are not kept clean by predominant wave action, or if too much algae and silt accumulate on the rocks, the walleye will not spawn there) but the walleye were not currently using them. Ardoch Lake walleye spawning bed, enhanced in 2017. As we navigated around Ardoch Lake and then headed back down river to Malcolm, we continued counting this thriving population of walleye. And although it may not have been the perfect night for incredible numbers of fish, it will always be an experience I will remember, one that reiterates why I love my job. Explore volunteer, internship and co-op opportunities. © Copyright Watersheds Canada. All rights reserved.